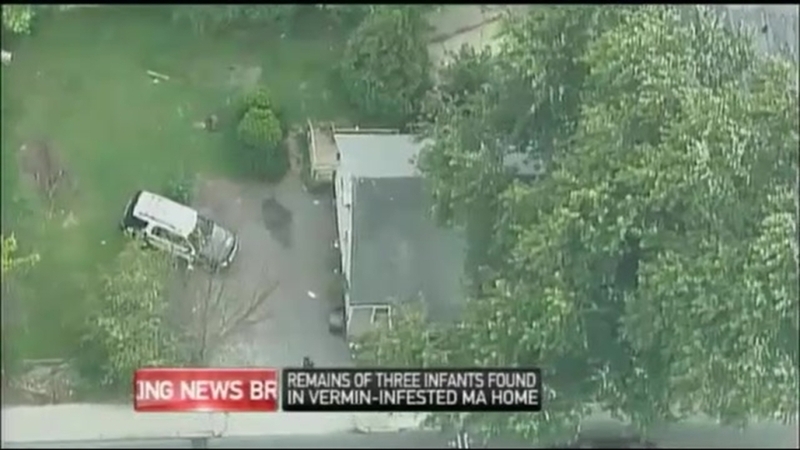 A woman is in custody after three infants' bodies were found in a filthy, infested Massachusetts home Thursday, two weeks after four other children living there were taken into state custody. Thirty-one-year-old Erika Murray will be arraigned on intimidation of a witness and other charges Friday morning in Uxbridge District Court, police in Blackstone say. The chief medical examiner will determine the cause and circumstances surrounding the three infants' deaths, whose ages and genders are not yet known, and their bodies are being removed from the home immediately, Worcester District Attorney Joseph Early said. A 6-month-old, a 3-year-old, a 10-year-old and a 13-year-old were taken out of the home by DCF two weeks ago, Early said. The child welfare agency said that someone reported the conditions, and it is working with investigators. A neighbor contacted police after one of the children approached the neighbor saying that the 6-month-old child was crying, authorities said. Early said the child was filthy. Detectives were investigating a case of reckless endangerment when the infants' remains were found, Early said. Hazmat crews were on the scene at the 23 St. Paul St. home Thursday. Early said that there were flies, bugs and feces in the home. Used diapers were piled over a foot and a half high in some places. Crews blocked the road off during their investigation. Chief Atstupenas of the Blackstone Police Department said there is no danger to the public associated with the case. According to the town assessor, the home is owned by Kristina Rivera, who currently lives in Woonsocket, Rhode Island. The Blackstone Police Department, Massachusetts State Police detectives, and the Worcester County District Attorney's office continue to investigate.